The Kansas City Chiefs were the reigning AFL Champions and off to a 3-2 start as they hosted the Houston Oilers on October 22, 1967. Coached by Hank Stram, the Chiefs were a well-balanced club with precision-passing QB Len Dawson operating behind an outstanding line, and with a productive running game as well, while rookie PK Jan Stenerud added an extra scoring dimension. The defense was a good one and had gained size up front with the recent addition of mammoth DT Ernie Ladd. Kansas City had lost a high-scoring game to San Diego the previous week but was expected to return to winning form against the Oilers, a club they had beaten in their first game. Houston was at 2-2-1 and had not posted a winning record in five years, including a 3-11 tally in 1966. 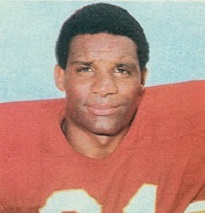 Head Coach Wally Lemm, with the help of GM Don Klosterman, had transformed the defense, in particular adding rookie LB George Webster (pictured above) and young veteran CB Miller Farr, who was acquired from the Chargers. 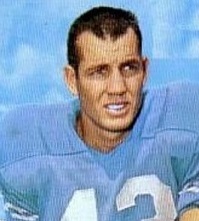 The offense remained a problem, however, and QB Pete Beathard was obtained from Kansas City two weeks earlier in the deal that sent Ladd to the Chiefs. There were 46,365 fans in attendance at Kansas City’s Municipal Stadium. They saw the Chiefs start off the scoring with a 40-yard Jan Stenerud field goal, but the early lead was quickly erased when DB Zeke Moore returned the ensuing kickoff 92 yards for a touchdown. John Wittenborn’s extra point put the Oilers in front by 7-3. Shortly thereafter, another big play on special teams helped the Oilers as DB Larry Carwell returned a punt 33 yards. The resulting possession ended with Wittenborn kicking a 45-yard field goal for a 10-3 score, which remained the tally heading into the second quarter. Carwell’s next punt return covered 26 yards to the KC 49, again putting Houston into good field position. Five plays later, Pete Beathard threw a touchdown pass to HB Sid Blanks that covered 39 yards and Wittenborn again added the point after. It got worse for the Chiefs on their next possession when HB Mike Garrett ran into an official while running a pass pattern and FS Jim Norton intercepted a Dawson throw and returned it 23 yards for a TD. Wittenborn’s conversion had the Oilers up by 24-3. The reeling Chiefs finally put together an 80-yard drive in 12 plays, the key one being a Dawson pass to split end Chris Burford that picked up 44 yards. Garrett ran for a five-yard touchdown and Stenerud added the PAT. Kansas City got a break when Moore fumbled the resulting kickoff and end Frank Pitts recovered, setting up a 13-yard field goal by Stenerud. The score was narrowed to 24-13 at halftime. Late in the third quarter, the Chiefs put together a 12-play, 85-yard drive to narrow the margin further. Dawson had a 24-yard scramble to reach the Houston two, and from there Garrett (pictured at left) ran for another TD. KC then faked the kick on the extra point attempt in an effort to pick up two points, but Dawson’s pass intended for TE Fred Arbanas was broken up by George Webster. There was no further comeback for the Chiefs, however, as the Houston defense kept them in check. In the fourth quarter, the Oilers were also able to keep an offensive series going thanks to a roughing-the-kicker penalty on a punt, and when they finally did kick the ball away a few plays later, the Chiefs had to start from their five. 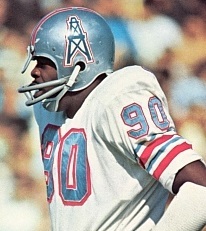 Kansas City had one last chance when Dawson connected with Burford for a 22-yard gain to reach Houston territory, but a fumble at the 31 with 2:50 left on the clock ended it and the Oilers held on to win by a final score of 24-19. The Chiefs dominated statistically, with big leads in total yards (323 to 127) and first downs (19 to 7). But they also turned the ball over three times, one of which led directly to a Houston touchdown, while the Oilers suffered one turnover. Kick returns also played a key role for the Oilers, with the one TD on a kickoff and the two long punt returns that led to points. Pete Beathard completed only three of 14 passes for 63 yards, but one was for a touchdown and none were intercepted. Flanker Monte Ledbetter had two catches for 24 yards and Sid Blanks gained 39 yards and scored a TD on his lone reception. FB Hoyle Granger led the Houston runners with 51 yards on 13 carries. Zeke Moore had the 92-yard kickoff return and Larry Carwell averaged 20.0 yards on his four punt returns. Jim Norton (pictured at right) helped with his punting, averaging 47.0 yards on 7 kicks, as well as contributing two key interceptions, one that was returned for a score and the other in the end zone to thwart a Kansas City scoring opportunity. Also on defense, George Webster had nine tackles and three pass deflections, MLB Garland Boyette was credited with 17 tackles, and CB W.K. Hicks had 13 tackles and broke up two passes. For the Chiefs, Len Dawson was successful on 17 of 31 throws for 175 yards but had no TDs and gave up three interceptions. Mike Garrett gained 69 yards on 19 rushing attempts that included two touchdowns and FB Curtis McClinton contributed 48 yards on 10 carries. Flanker Otis Taylor had 6 catches for 40 yards while Chris Burford gained 97 yards on five receptions. The luck was generally good for the Oilers during the rest of the regular season as they went 6-2 the rest of the way to win the Eastern Division with a 9-4-1 record. Houston’s defense led the AFL in both fewest rushing (7) and passing (10) touchdowns allowed, and gave up the least points overall (199). However, it couldn’t stop the Raiders in the AFL Championship game, which was a 40-7 rout. Kansas City bounced back to win three straight, but they were unable to keep up with Oakland in the Western Division and placed second at 9-5.